Half way into summer calls for a recap! 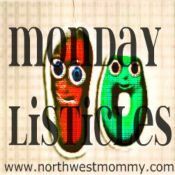 10. and since it is 10 minutes past midnight I can declare this a Monday Listicle! Now that’s something!!! Thanksgiving couldn’t come fast enough. It is by far my favorite holiday. Perhaps because it is the only one I did not grow up with and I took the time to learn about it and understand it as I became American. Perhaps it’s because it comes with pumpkin pie. But I really really love Thanksgiving. This year it will be extra special because we are sharing it with our new found friend Karin who is like me Slovenian and with or good old friend Lily who is on her way back to visit us. So excited! This list is the easiest one to write. There is so much to be thankful for. My family, my friends, our health, warm home, beautiful state we live in, chocolate. List could go on forever. So I will try to find just one special thing about others that I am thankful for every single day. Curious to see your lists. Happy Thanksgiving! 9. Amy for being awesome. 10. You for always passing by. Thank you. What’s new with you? Are you keeping warm? 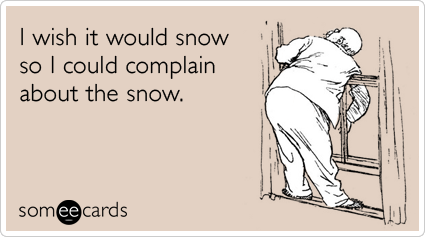 Anyone snowed in yet? The wastefulness drives me nuts. Like Oprah’s Teavana tea. You pay $15 for 2 OZ of loose tea that is packed in an 8 OZ can that is packed in a huge and very fancy cardboard box. The worst part is that aside from wasting resources to make this elaborate package, presumably to make us think that it’s OK to charge that much for a tea blend they waste money they could be giving to the charity they claim these tea was made to benefit. Enough with wasting money sending us mailing labels, christmas gifts, totes and such with an attached letter asking to help your cause. How about you take what we subscribed to give and instead of spending it on things to entice us to give more you all just give it to the ones you promised me you would. The ones in need! I don’t get it. Don’t we all pay loads of money every month to have these channels? Then what’s with the whole pill for this and that commercial every 7 minutes? Specially when there is an abundance of empty ones two rows down. Cause taking 10 extra steps is bad for you why!!? I ordered something from J.Crew a few weeks ago and it took them 9 days before they shipped it, another week before it arrived. If it is a small company I wouldn’t mind but if retailers makes millions with online sales they really should ship within a few days of the order being placed, specially since all items I bought were in stock. Once my order got here my sweater’s seam unraveled the first time I wore it. My son’s t-shirt follow the same fate after the first wash. Yes I know I can call them and maybe they will replace it but frankly time is money and the effort it takes is sometimes just not worth it. It does sadden me when I realize just how awful products from our most prominent companies in the USA are. Oh how I hate anything low fat and organic and natural and healthy and such. Fact of the matter is that labeling chicken ‘free range’ doesn’t have to mean it also eats healthy. It just means it has access to outdoors. For all you know it is full of antibiotics and corn anyways, sitting in a concrete yard… I think we should be able to decide what we buy based on the true labels on a product. Not everyone demands free range chicken but those who do should rest assure that that animal roamed free and only ate what it found. Period. Seriously, why on earth do people leave their car on as they go into the store or to pick up their child or whatever. And honestly in my book it is equally bad if anyone is left in the car or not. Engine of the car is designed to move it. So if you are parked you don’t need it on, right? Truth be told driving on roads these days and seeing what people do behind the wheel is enough to make us loose faith in humanity. I actually really dislike complaining. I believe doing is better then talking about it. But sometimes we must vent about things we seem to be unable to control. Like politics and weather and school drop off traffic.